We love the Volkswagen Phaeton, but Americans couldn't wrap their minds around a Bentley-platformed VW luxury sedan that cost as much as two Jettas and it went away for seven years. 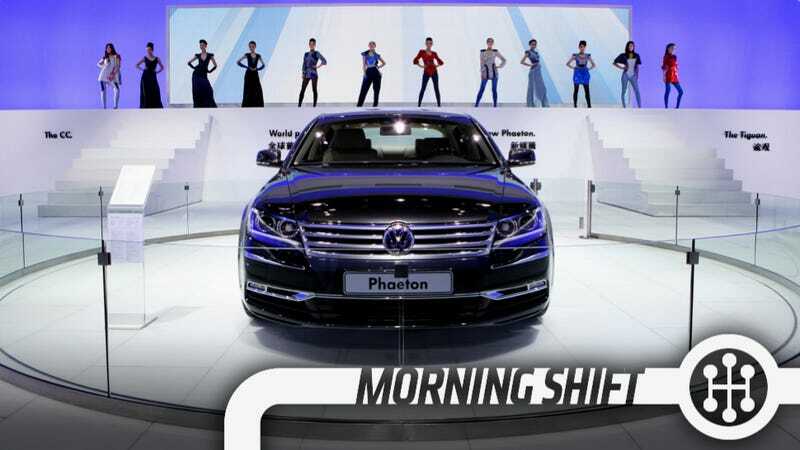 Now, according to Bloomberg, we're going to see the next Phaeton at the Detroit Auto Show. "A brand as large as Volkswagen needs a halo project in the upscale segment," CEO Martin Winterkorn told Bloomberg at a conference in the company's hometown of Wolfsburg, Germany, this month, confirming that the Phaeton will return to U.S. showrooms. "We've seen what happens to brands that don't have that kind of project." Yeah, the new Passat is a very nice Toyota Camry, but a premium car it isn't. Having a halo sedan is a great idea. Also per Bloomberg, though Tesla is up a ridiculous amount this year, it's still a stock and it's still subject to some rationality (or irrationality). Goldman Sachs Group set a price target of $84, much lower than the record price of $129.90. Their reasoning? Demand could fall and, as with every other automaker, higher rates tend to mean lowering auto stocks. If you have Tesla stock you shouldn't freak out. It's volatile but it's also still way-way up. Nissan's said "whooaaa there" to the Infiniti LE electric car, and not just because it isn't named the QED or whatever. When the company showed the car in NYC last year they said they'd have it on the market in two years, but The Wall Street Journal reports that this may be on hold until it can see new advances that would make the car better. "Certain technologies that we see now, which we didn't see two years ago, are going to be available in a time frame that was relatively close to where we were going to introduce the Infiniti," Mr. Palmer said. "Rather than miss those opportunities, and then have to reconfigure the car to adopt them in its life cycle, what we wanted to do is to bring those from the beginning." Conveniently, no one at Nissan could say what the hell those technologies are. I've never had any major problems using the infotainment systems in Hyundai-Kia vehicles other than a Sonata not recognizing my iPhone 5. The commands are sensical, the touch-screens typically have redundant hard-touch controls, and the visuals are appealing. The same can't be said for MyFord Touch and, as Karl Henkel explains, the improvement in Hyundai's quality rankings can be largely tied to the improvement in the BlueLink system (Kia's UVO is also pretty good). To paraphrase Bill Clinton, there's nothing wrong about Suzuki that couldn't be fixed with what's right about Suzuki. I.e., the now defunct American automaker could have taken its best product from Japan/Europe and sold it in the United States. The Kizashi was a good car that no one knew about and the SX4, while aging, was still a nice buy (I'd pick up a used one). Seeing Europe's Suzuki SX4 S-Cross wagon-y thing makes me miss them even more. The 4WD model is a handsome, fuel efficient, well-designed little wagon capable of performing off-road with the SUV but without the sacrifices in driving dynamics. I miss the SX4 already. Nils Bohlin, the Swedish engineer and inventor responsible for the three-point lap and shoulder seatbelt—considered one of the most important innovations in automobile safety—is born on July 17, 1920 in Härnösand, Sweden. Neutral: What's the best new infotainment system? Assuming you have to have an infotainment system in your car, which one is the best?